Our featured author of the month is Jakov Lind, an author whose biography, as you’ll read below, is absolutely fascinating. To celebrate his work, we’re offering 30% off on Landscape in Concrete and Ergo all month—just use the code LIND at checkout. Joshua Cohen (The Book of Numbers, Witz) wrote an amazing introduction for our edition of Landscape in Concrete. Given the sales history, I’m 160% certain that the vast majority of you have never read this. Do it! Do it now! Give me this one thing! Because after you read this? You’re going to want to read the book. “Jakov Lind” was a pseudonym for a man without a name. According to the rolls of a host of long-since defunct regimes, “Lind” was once known as Jakov Chaklan, Palestinian Jew (this was back when you could be one of those), and before that he was Jan Gerrit Overbeek, Dutch bargehand, which was the Nazi-era identity of Heinz Landwirth, Viennese. 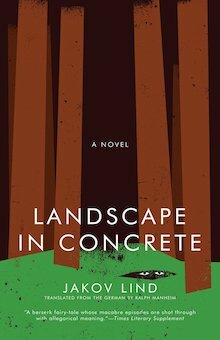 The author of Landscape in Concrete—and also of the stories of Soul of Wood, the novel Ergo, two other novels, another collection of stories, an Israeli travelogue, three memoirs, numerous stage and radio plays, and occasional poetry—might have been all of these people, and he might have been none. This is not meant “deconstructively,” however, or in a spirit of relativism. What’s being asserted here, at the beginning, is trauma. Is not knowing what to call one’s self. Is not having a private name for one’s self. (Before we go any further, it should be said that Lind’s autobiographies, written in English in London, are the only sources for information about Lind, and also about Landwirth, Overbeek, Chaklan, et al. How reliable they are depends exclusively on one’s sense of humor.) His father, their father, “was a Viennese businessman without much business in the world. Half Luftmensch and half duke.” A traveling salesman, Simon “claimed to be selling underwear to nuns.” Patrimony lay in Galicia, far over the Tatra Mountains in Poland, which would make Landwirth père a true Viennese. By contrast, the portrait of the author’s mother, Rosa née Birnbaum, is hazier; she “had no money, four children, and no help in a three-room flat.” She was known as “the Saint. The Good One. The Strong One. The Patient One.” The marriage was relatively happy; Landwirth was mothered by sisters—he would always be surrounded by women. The author’s war departs from this domesticity, never regained. With Hitler returning to annex his homeland, Landwirth was sent to the Netherlands on a Kindertransport, along with a sister (Ditta). His parents managed to make it to Palestine, where their ship, refused port by the British, was bombed by the Haganah. Landwirth boarded for a time at a Zionist farming school in Gouda, desultorily training for his own resettlement. When that school was shuttered amid Nazi occupation, Landwirth went underground (1943 marks the end of his formal education). Angered by the complacency of the Dutch Jews, who, he thought, were just waiting for their deportations east, Landwirth purchased appropriate papers and became Jan Overbeek; the young Dutchman explained his native German by claiming an Austrian mother, which was “true.” As Overbeek, the author found work on a barge, plying the Rhine from the Hook of Holland down to the Ruhr Valley—one of the most postcard-perfect parts of the Reich. On furlough, Overbeek contracted the clap from a prostitute, and was ordered to a sanatorium to recover. There, he was recruited by a scientist-soldier to serve as a personal courier in an office attached to Das Metallurgische Forschungsinstitut des Reichsluftfahrtministeriums, “The Institute for Metallurgical Research of the Imperial Ministry of Air Traffic.” When Allied bombs are falling even by day, and Berlin’s being threatened, what’s a Jew passing under false papers to do? Overbeek mimicked a Nazi. It’s unconscious, Lind tells us; one nods and obeys, one adapts. Overbeek had no way of knowing that this Nazi scientist, who refused to allow Overbeek any contact with friends (and certainly not with any female friends), was spying on the Reich’s nuclear program, making reports on the progress of the Cyclotron to the British. London was also where the writing began—drafts initially intended, according to Lind, less for the proof that is publication than as an experiment, an interrogation accomplished on paper. Though he’d been writing fragments for years—beginning diaries then abandoning them when the poetry became too personal and the philosophy muddled in language—could Lind write fiction, could he write fiction that was truer than fact and in German, the murderers’ tongue? Which brings us to Landscape in Concrete (Landschaft in Beton, 1963), Lind’s second published book and the novel that cemented his reputation after the freak, international success of the great, short-form Soul of Wood. Landscape concerns one Gauthier Bachmann of Duisburg-on-the-Rhine, an aspiring gold- and silversmith, and an oafish sergeant in the German army. The setting is Eastertide, 1944. As the book opens, Bachmann’s just been released, or has escaped, from a sanitarium at Oppeln (known as Opole, in Poland), where he’d been recovering from a humiliating defeat at Voroshenko, a Soviet forest in which his entire regiment is said to have drowned in the mud—763 of them dead in the first five minutes of battle, as he tells it once, or within three hours, as he tells it another time, in October 1941. Lind’s novel narrates Bachmann’s pitiful attempts to rejoin that Second Hessian Infantry Regiment, Eighth Battalion, or, failing that, to join any detachment that would have him and his formidable size (six-foot-two, three-hundred pounds; he’s often described as a bear) and talents (Bachmann is in possession of the gold star for marksmanship; for “shooting twelve Russian monkeys off a roof” at Stalino, today Donetsk, in Ukraine). Besides the naïve, Nazi-Svejk Bachmann, and the “angekok” Halftan (who, it’s noted, has the same first name as the president of the Reichsbank), essential characters include: Xaver Schnotz, a poisoner and army deserter; Peter von Göritz, a predatorily homosexual Major; the Elshoved family of Norse nobles; and Helga Okolek, Bachmann’s Behemoth girlfriend, “Aryan” but with a Slavic surname. Supporting appearances are made by a lesbian gynecologist-landlady (murdered) and a Bulgarian Gypsy violinist (arrested). As Bachmann marches east at novel’s end to rejoin his regiment at the front—after it’s officially ruled that he is, in fact, not insane and will not be discharged, as he’d suspected, as he’d feared—Lind’s landscape is momentarily barren (“The sun hovers red and flat in the sky, unwilling either to rise or to set.”) and the only thing that can be said with any certainty is that its author survived. In the grass by the river bank [Bachmann] opened his coat and tunic, pushed up his sweater and undid two shirt buttons. He wanted to feel his heart with his fingers. The heat of the day lay heavy, like too much tenderness, over the gray and green colors of the Rhine. The ticking he heard was the engine of a barge. Then with wide-open eyes he saw more barges floating through the mist that rose from the water. They’re carrying fuel to hell and stones for the wall of the city of the dead. Desertion leads to a quarry. Branches growing out of the clouds. Schnotz says: Your turn will come. What’s written on the barges? Basel, Rotterdam. Aha! Secret names of the gates to the other world. Cement, stones, sand. A giant is carrying them through the water on his shoulders, wading step by step through the mud. A fool. Who told him to do that? If he’d pick up the cargo and throw it all overboard, and if the other giants did the same, we’d all be saved. The chunks of red meat would be cleared away. The crime can be discovered any day. What then? Upstream and downstream they go, day after day like galley slaves, they would have the power to sweep away the danger. Only the giants are strong enough. I’m one of them. When it is all put under the concrete and the sun shines fiercely on it, nobody’ll know any more what’s underneath. The corpus delicti will be gone. Nothing is more dangerous than sitting still. I’m shoving off. A word about style, then we’ll shove off. One’s war became one’s writing. If the Holocaust is to be regarded as a perfection of Europe—technologically speaking, especially—then the writing of the Holocaust might represent a perfection of European culture: Accounts of the tragedy have almost always been technically sterile, stylistically orderly, factual. Classical, Apollonian, to a fault. Elie Wiesel’s memoirs, to take as example the most popular, have found, within the camps, amid the gas chambers and ovens, an order to obey the logic of humanistic experience. Wiesel’s sentences and paragraphs tried, and still try, to impose reason—a reason derived from a reverence of tradition, of continuity, in the face of diabolical incoherence. His works are resultantly direct, in-line, accounted-for; nowhere has Wiesel allowed evil to invade the flesh of his French prose. Hell is the subject, then, and not the object. But Lind’s war was not survived in a camp. There was no Appell for Lind, no line-ups, no count-offs; there was no order in his survival, and so no order in his prose. His writing is disorganized, ungrammatical (Lind’s German was brilliant but, in every respect, adolescent). His war was riven with evasions and impersonations, and so, too, is his fictional landscape. He is the one Jewish novelist of the Holocaust who, in a major European language, expressed the Holocaust not through language, but in language. As language. (One has to read in Yiddish to find anything comparable.) To be sure, this was aestheticizing horror. To be sure, this is what writers do. Or are supposed to do. Not all translations are so perfect, however. Lind writing in English, which he did from 1969, was yet another “Lind”—displaced from German, distant from its slangs, forced to the cooler imagination of what was his fourth fluent language (German, Dutch, Hebrew, English). If the enduring Soul of Wood was the beginning, Ergo marked the end of his fictional promise, and only memoir could follow, written in a knowing, polished version of what London’s German-speaking “expatriates” called “Emigranto”—what Lind once referred to as “DENGLISH oder ANGLO DEUTSCH.” Counting My Steps, Numbers, and Crossing were those memoirs. The other, slighter, novels were Travels to the Enu and The Inventor, which went almost unreviewed. In the 1990s Lind got sick; good friends and editors died by the year. Before Open Letter decided to bring them back into print, the only available English-language copies of Lind’s novels were used: $1 each, over the Internet; two memoirs I purchased for that sum at Manhattan’s Strand bookshop had even been autographed (“To Albert,” “To Alfred”). A draft of this introduction was written as an essay for The Forward, intended to mark Lind’s 80th birthday; it was published a week before his death. Three or four people (older, huskily-voiced women) phoned me after that, telling me how kind Lind was to them in New York, how funny he was, how they regretted they “never got around to reading his novels.” But fiction followed by fact that must, in turn, be followed by silence, disappearance, neglect, and regret is a reduction we readers cannot accept, or allow—though that might have been the daily-felt fate of the writer. “Jakov Lind” doesn’t just deserve to be read; he’s necessary, both in the vicissitudes of his life and, too, in the work he created. His books are a late bloom of the European Jewish landscape, straining sunward through the concealing concrete.